Guatemala is estimated to have a 40-50% indigenous population, mostly Mayan (in stark contrast to El Salvador where the indigenous people were purposely purged and make up a small and unnoticeable part of the population). 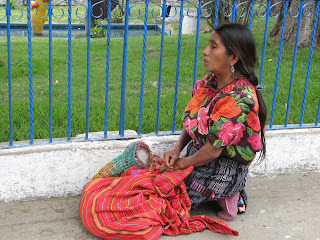 The Mayan people retain their clothes and traditional spiritual practices mixed with strong Catholic faith. The belief systems were parallel enough to co-exist. The Mayan clothing is part of what makes the country so colorful and, even in Antigua, the Mayans were there, wearing their woven fabric skirts, held up with woven belts and topped with gorgeous huipil shirts with stunning weaving and embroidery in vivid colors. 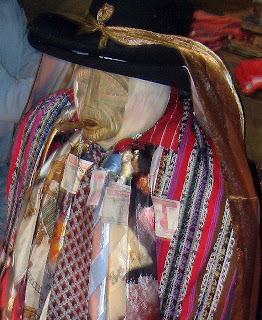 They wore weavings on their heads as well and carried their children in woven shawls on their backs. We fell in love with the gorgeous textiles. Alas, they are also aware that we tourists want to buy their wares and set their prices where they think you will buy (as high as they can). Luckily, everyone barters for everything and we never found something we couldn’t walk away from if the price was too high—it was just exhausting and solicitation was the name of the game. It’s best not to ask the price unless you are ready to buy because, once started, the bartering process does not stop. They will follow you everywhere lowering the price as you go even if you weren’t really interested in the item, just curious about the price. We were hounded by merchants and guides until we learned that lesson!! We left Antigua after a week to explore more of the fascinating country. 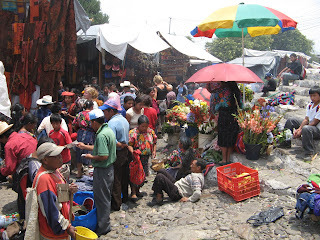 First we headed to the famous Chichicastenango market in the highlands. Chichi is a town that is nearly 100% indigenous Mayans. We signed up for a $5 shuttle for the 2 hour drive, a minivan with 9 other tourists. Unbeknownst to us, the tour agency had not been able to get enough people for a van to Chichi, so this van was going to Panajachel, an hour away from Chichi. One other couple on the van was also going to Chichi and the driver planned to stop in a town between the two and find us a ride to Chichi. Well, we were annoyed, but at least there was a plan to get us to our destination. We were dropped in Los Encuentros and loaded onto another minivan for Chichi. This van, however, was a local transport full of local people, mostly Mayans. “Full” in this case referred only to the technical fact that the 4 of us took the last remaining “seats” if you count the fact that Richard and I made the 3rd and 4th people on the back bench seat made for 3. Clearly, over the next 30 minutes we learned that filling seats is only the beginning of filling a van. By the time we arrived in Chichi, we had more than 25 people in this 11 person van—OK, 3 were kids, but they still took up room!! We found ourselves heartily amused and gave up our annoyance at the tour agency because we had such an entertaining experience. Personal space is such an American concept! The Chichi market was in full swing when we got there. We quickly found a hotel recommended by friends, dumped our packs and hit the market. It was overwhelming. We had a couple things in mind we wanted to purchase after our wanderings in Antigua, but, mostly we were just looking. The scene was amazing with blocks of stalls selling everything but largely full of the gorgeous textiles. Everyone was hawking their wares. At times there was no room to move. We had no sense of orientation in the town as the stalls of the market allow no visual reference to the streets they fill. As we wandered, we found the church which is a Mayan/Catholic church. 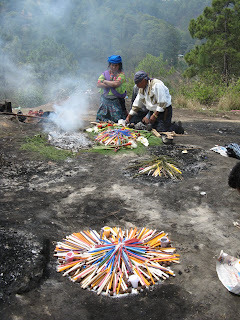 Inside are cruicifixes as well as altars on the floor where Mayan spiritual ceremonies are conducted. For lunch, we extracted ourselves to a second story restaurant to get some peace and catch our breaths and have, as it turned out, a lovely buffet lunch for $8 each that served as both lunch and dinner. We returned to make some last purchases. Richard inadvertently pulled off one of the classic bargaining strategies where he walked away in disgust at the high price of an item and left me there as the merchant called after him with lower prices. A street vendor cackled beside Richard as she watched the interaction as I said various things about “mi esposo, muy caro, etc.” and she cackled and pulled on his sleeve, “mi esposo, ha, ha” until we got the price he stuck to and she nodded as she recognized the ploy. The hotel we found was marvelously comfortable and pretty and we collapsed there after our market ordeal. We walked through town in the late afternoon to watch the market be disassembled. The stalls looked so solid that we imagined they stayed in place all week. To the contrary, we watched as everything was removed through the afternoon and evening only to be reassembled on the other market day, Wednesday. Meanwhile, we picked up a guide who would not let us alone (due to a bargaining misstep on my part). Ultimately, he took us to the Mayan shrine on the hilltop the following day where we watched 3 Mayan ceremonies take place led by shaman. The ceremonies were for better business or health or anything and were quite pricy for the locals probably costing $70-100 for a ceremony. There have been sacrifices done on this shrine, but none were done the day we were there (and no humans anymore). Our next stop was beautiful Lake Atitlan, a volcano ringed lake up to 1000 feet deep surrounded by mainly Mayan villages doing traditional farming of corn. The launch to the villages is from Panajachel, a touristy town full of hippies. We saw lots of dreadlocks and tie dye and felt old. We hopped on a lancha (basically a panga) which drove to the various villages. Our chosen spot was San Marcos, a place with a famous spiritual retreat known as Los Pyramides. You all know us well enough to know that was not our destination, but we had heard good things about this town. It turned out not to be our cup of tea, particularly Richard’s who found it overwhelmingly “woo, woo”. For me it was simply a lovely place that was jarringly incongruous—gringoes “finding” themselves through meditation, massage, yoga while the poor indigenous people sold mangoes on the paths and lived above in their very poor village. The hotels and restaurants were scattered in fairly dense woods connected by footpaths, not roads, and we were routinely warned about not hiking with valuables and of recent robberies. Our hotel was lovely, cheap and without soundproofing, but a good bed and bath made up for that. One night was all we chose to do there which we regretted but only in retrospect. There was no view of the lake from the tourist settlement due to the thick woods, but we did hike to breakfast the next morning at a stunning hotel overlooking one of the bays and appreciated the local beauty of the spot. 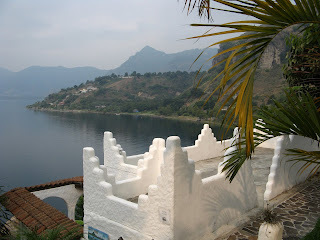 We packed up and left for Santiago Atitlan, a town on the opposite side of the lake. There we were amusedly anticipating our visit with Maximon, the revered and very important local god idol we had heard so much about. Santiago was a poor indigenous town, dirty, a bit apathetic toward us (bordering on a sense of hostile) other than our role in buy, buy buy. (As one fellow tourist put it, “it’s our job to buy things while we are here.”) We learned that many of the Mayans don’t speak Spanish—only now the children are being taught Spanish in school—they speak one of 22 Mayan dialects and that may have been why people didn’t seem very friendly—the only way for us to communicate was in our rudimentary Spanish. A potential guide hounded us unmercifully until we escaped into a gallery and ultimately to a restaurant for lunch. We had hoped for young boys to take us to Maximon as had happened to our friends, but none were around until the next day when we had already made the visit. We checked into a hotel that we think prompted another friend, recently returned from Guatemala to comment, “We just hope we didn’t catch anything that is hard to get rid of.” This hotel was cheap ($13/noc) and basic. The sheets seemed clean and the water in the shower was hot, but, woe to the person who touches the wall or the floor with unprotected skin. The ceiling was corrugated iron with peeling paint. Did we mention it was inexpensive? The town did have a couple luxury resorts but they were quite a bit out of town on the lake. We happily left Santiago the next days via chicken bus for a 4 hour drive to Guatemala City. This chicken bus never got completely full and we had a pleasant ride through lovely countryside passing whenever and wherever we could and driving as fast as we could all to the tune of Latin music. Vendors entered and left from stop to stop and we were serenaded by a pair of singers with their guitar for about 30 minutes trying to sell their CD. In short, we were entertained the whole time. We taxied to the bus station for the next leg of our trip and spent too much time waiting for our overnight bus to Flores near the Mayan ruins of Tikal. At last the bus came and, anticipating the wonderful luxury of our El Salvador/Guatemala bus, we were sorely disappointed. We planned to travel from 9 PM to 5 or 6 AM and get our sleep on the bus (saving a night’s hotel in the process). We became quite cold from the AC and asked for blankets. No blankets. No pillow. There was a movie but the sound system filled the bus—no choice, we all had to listen to it. There was a “meal”—a sandwich of a tiny bit of chicken, ketchup and cabbage on a roll. Beggars can’t be choosers we reminded ourselves. Last, the seats didn’t recline nearly as much as on the other bus and there was no support for the lower legs. Hmmmph. Long night. Of course we were exhausted when we arrived in Flores. Still we managed to find a shuttle to Tikal with some other folks, found a hotel in Tikal and crashed. The hotel was more expensive than our usual, but it did include dinner and breakfast, had a pool and was lovely, and, when we saw our room, we were tempted to move in permanently after the places we had stayed before. The room was huge with a large bathroom (tub and shower), and the grounds were surrounded by nice plantings backed by jungle. We could hear howler monkeys and parrots much of the night. In the afternoon, we entered the park for the first time. Tikal is a Mayan civilization ruin, continuously occupied from about 600 BC to 900 AD, with its peak of civilization around 750 AD. The Mayans built pyramids up to about 80 meters tall, were excellent astronomers, had beautiful carvings, hieroglyphic written language and up to 100,000 people lived in this one site. Unlike other ruins we have seen, Tikal rises from the jungle and is not yet fully excavated. While the Mayans were there, the jungle surrounding their town must have remained clear, but, currently one hikes between thick jungle areas to the next pyramid. From atop the taller pyramids the other pyramids poke out of the jungle canopy. As evening came, we saw spider monkeys swinging in the trees as we descended a pyramid and watched parrots flying tree to tree calling to each other. We watched the sun start to set from atop a pyramid facing west. The following morning, we were at the park at 4:30 AM. We walked with a guide through the dark jungle with our group of 10. Howler monkeys roared in the trees around us, frogs croaked and parrots squawked. We were the first group at the distant tallest pyramid and we quietly climbed to a lookout to watch the sun rise. Several other guided groups arrived until there were more than 50 people perched on the pyramid looking to the east. Alas, it was too overcast for a sunrise so our guide pulled us aside and took us away from the pyramid and through the site to teach us more about it. He was an astute wildlife observer and showed us a variety of birds including toucans, parrots, woodpeckers, a type of turkey that lives in the trees, spider and howler monkeys and we saw a fox trotting through the site. The wildlife is the reason to get up so early. In short, it was an incredible experience overall. After the early morning site visit, we relaxed at the hotel a bit then headed back for the reverse trip to Guatemala City (via overnight bus again—better prepared with sweaters this time), and on to El Salvador. We arrived at our boat after 21 hours of continuous travel and were pretty thrashed. Still we were ecstatic about our experiences and delighted to find our home much as we had left it. Other than one overnight, we’d been gone over a month. Boat sweet boat!